This is a very simple, yet tasty dish as the main time is spent cooking the chicken. Frying the egg and laying out the cucumber won't use up much of your precious time. My whole family loved this. I omitted the chilli padi for my children. So I cooked in two batches. Enjoy with your whole family! 1) Fry the egg with lots of oil. Must be really hot so that its a deep fried egg but make sure you don't overcook it so that the yolk will still be runny. Set it aside. 2) Pound the garlic with the chilli padi (for spicyness). If you are cooking for your children, then just pound the garlic. 3) Put in the pounded garlic and chilli into the oil in your hot wok. Keep stirring. put the chicken in and put the fish sauce, oyster sauce, dark sauce, and sugar into it. Finally, off the fire and throw in the basil leaves and still continue to stir in the hot wok. 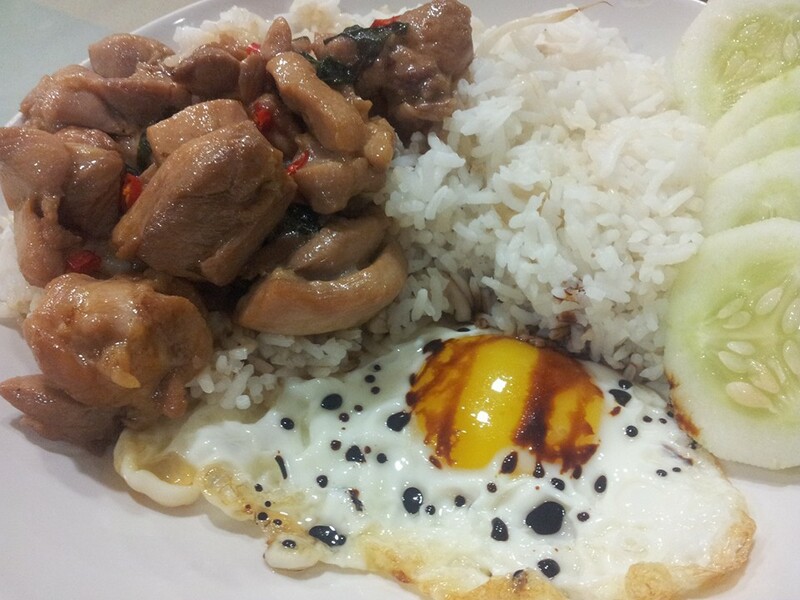 4) Finally, serve over rice and put your egg in as well as slices of cucumber. Enjoy!